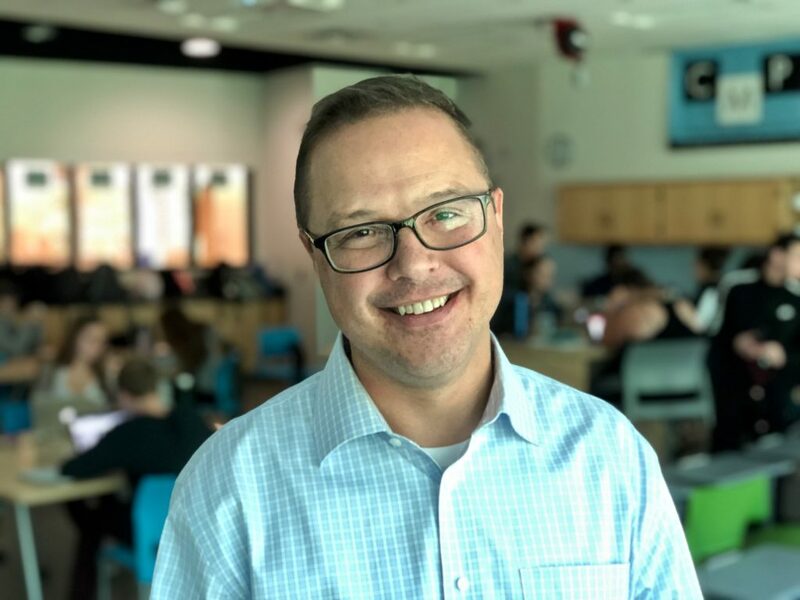 Ross Dunbar teaches social studies, communication, multimedia production, and public policy at Skyline High School. He has been a public school teacher for 17 years and is an attending teacher with the University of Michigan School of Education. Born and raised in Ann Arbor, Dunbar is a proud graduate of Thurston, Clague, and Huron. Prior to teaching, Dunbar worked for a decade in the private sector as director of new media for the American Society of Mechanical Engineers (ASME), senior web developer for Thinkmap, database programmer for the American Institutes for Research (AIR), and technical writer and contributing author for Battelle. Dunbar earned a bachelor’s degree with honors from Oberlin College, a master’s degree in information systems from Johns Hopkins University, and an M.Ed. from George Washington University. He lives in Ann Arbor with his wife Mitra, daughter Ayla, and son, Nico. What is your fondest memory of high school? I remember a lot of amazingly caring teachers at Huron High School. If you could go back to high school, what would you do differently? I honestly wouldn’t change anything about it, except to have taken better yearbook photos. Some of my current students were able to find my old yearbook photos in the library at Huron High School. They were amused. Who inspired you to become a teacher? My mom Nancy, who gave me the best advice about changing careers after I couldn’t stare at a computer screen in New York City anymore. She was an AAPS teacher for 31 years at Logan and Northside. How does your work as an attending teacher at the University of Michigan affect your teaching at Skyline? My experience with U-M School of Ed has allowed me to learn from—and to share—best practices in social studies with teachers from other school districts, and to also work with new teachers in training in social studies. What’s the best compliment anyone could give you? When a student says an activity that we’re doing is really interesting. I love the creativity you can bring to teaching. Sometimes activities that you create fail miserably, but it’s never boring being a teacher. In which other teacher’s classroom would you like to enroll, if only for a day? Why? Spike Lee’s film class at NYU. He is the most creative teacher of creativity on the planet. In your years in AAPS, what’s the most important thing you’ve learned about teaching? In my 17 years of teaching, 10 with AAPS, the most important thing I’ve learned about teaching is that you can always improve as a teacher, and the best way to do that is to truly listen to students and to be willing to fail at a lesson by trying something entirely new. Those of us who are not Storer Camp grads would like to know what that means. The YMCA Storer Camp “I’m Third” motto that I remember from attending as a student at Thurston meant to always put God (or your moral belief system) first, other people second, and yourself third. What are your thoughts on Skyline’s magnet programs, and how do students benefit? 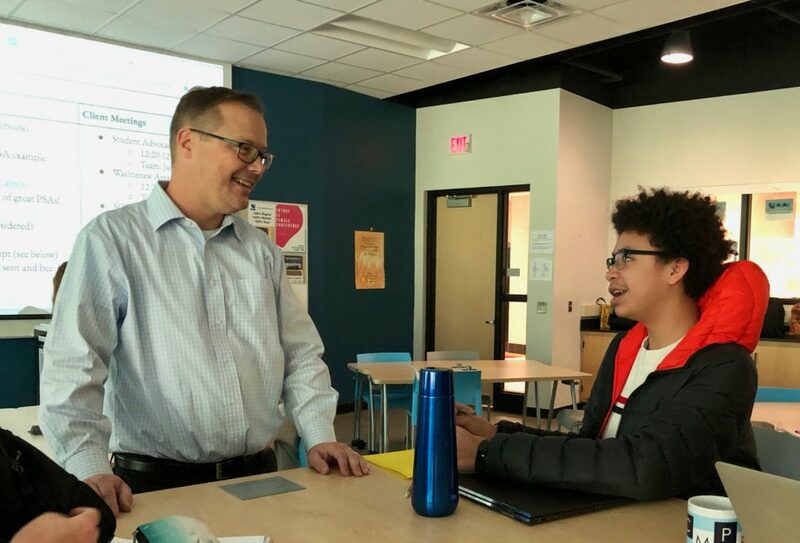 The CMPP magnet program at Skyline is entirely skills-based and innovative. 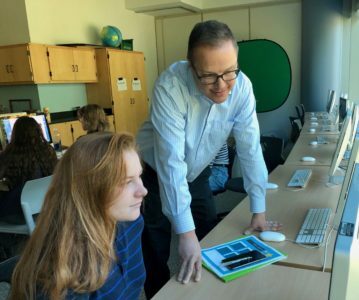 It allows students to pursue their passions and interests and also provides an external audience for every digital product the students create. That’s hugely motivating for students. What’s the best thing about being a teacher? It’s never boring on any day. You cannot say that about most careers. What advice would you give to a first-year teacher? Be willing to have a lesson plan that fails because you were trying something new to motivate students. Also, admit a failure to your students when it happens in a lesson, they respect that and will have much more buy-in to your what you’re trying to teach. How do you keep students engaged? I always think to myself the night before when I’m planning a lesson: “Would I want to do this as a student?” If the answer is no, then do something else. That will keep you and your students engaged. How do you think students will remember you and your class? I hope that they will remember my classes as fun and that they learned many valuable skills that helped them be successful in their future endeavors.